Nectar & Root Bridal houses a curated dress boutique situated within our floral design studio here in Vermont, with flowers and vases tucked behind racks of lace and raw silk. When dreaming up wedding floral designs for her clients, owner Erin Ostreicher is constantly inspired by the dresses her brides choose to wear. Nectar & Root's bridal shop connects the dots between where Erin draws inspiration from, and her overall established aesthetic within the wedding industry with design work already featured in Martha Stewart Weddings, Style Me Pretty, Green Wedding Shoes, 100 Layer Cake, Botanical Brouhaha, Brides, Snippet & Ink, Elizabeth Anne Designs, and Wedding Sparrow. Our shop is proud to support other up and coming female entrepreneurs through the designers we carry. Our hand-picked indie makers sew garments that range from loose and silky kaftans to exquisitely beaded, long-sleeved lace gowns. We house an eclectic mix of materials in various textures and neutral tones (beyond white!) – for a beautiful yet uncontrived take on bridal. Many of the pieces we carry are born of collaborations between owner Erin and the designers she has chosen to work with, creating one of a kind in-store favorites inspired by botanical flowers. We also carry unique wedding veils, jewelry, hair crowns, belts, vintage wedding dresses, and non-bridal gowns that would serve sweetly as honeymoon or rehearsal dinner pieces as well as wedding accessories. Our dresses are queenly, comfortable, gorgeous, and empowering. The Nectar & Root bride is her most essential self on her wedding day. Whether simple and luxurious, fitting like a glove, or of an Edwardian era, the dress she wears brings a Nectar & Root bride stunning looks and an easy radiance when she says her vows. 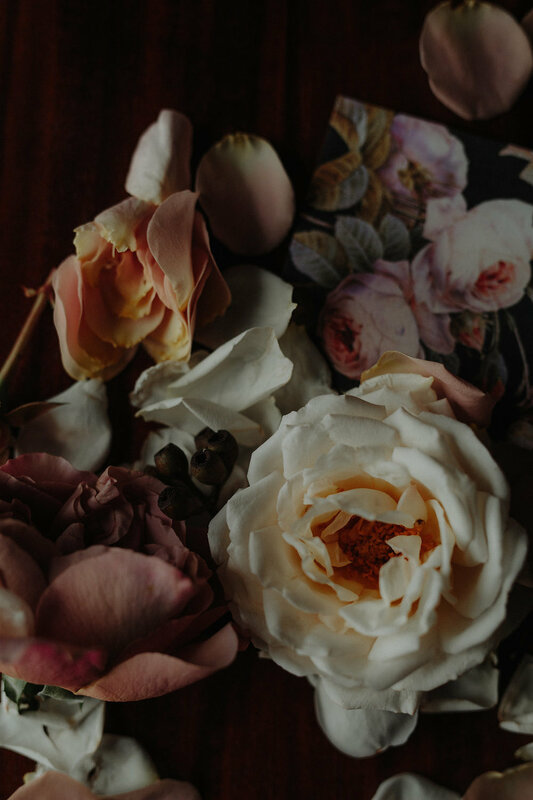 Our bride supports wildly talented, small-batch creatives through her wedding investments which run deeper than lace, a delicate petal or a dusting of blush. She may have a penchant for flowers and be marrying in a backyard garden, a chic candlelit restaurant or an opulent villa. She might live right around the corner from our shop past the evergreen trees and blackberry bushes, or she may be planning a destination wedding in Vermont from a big city afar. She is seeking indie brands, emerging makers, and a collection of choices she hasn't tried on elsewhere, to find a gown that feels quite special; that is, indeed, 'the one'.